Ivanka Trump, President Donald Trump’s daughter and a senior adviser in his administration, says she’s hopeful that her push for paid family-leave legislation will come to fruition next year. “I’m cautiously optimistic it can happen next year,” she said during an Aug. 2 event in Washington hosted by Axios. 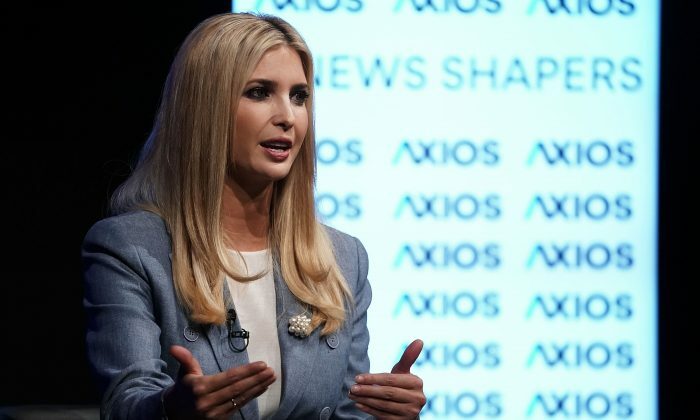 While the president has talked about paid family leave since early in his campaign, it hasn’t been part of the “lexicon” of establishment Republicans, Ivanka Trump said. She’s worked for a year to convince the GOP to back a “fiscally prudent” version of the measure. Sen. Marco Rubio (R-Fla.) on Aug. 1 introduced one such option that would allow parents to draw Social Security benefits during family leave in exchange for postponing retirement by three to six months. Ivanka Trump said “several other Senators” also plan to introduce legislation. She noted there’s now “unprecedented opportunity” for Americans wanting to find or change careers as the booming economy offers more jobs than there are unemployed people, according to the Bureau of Labor Statistics. The trouble, she said, is that job seekers can’t learn from the bureau in what locale the jobs are available and what skills are necessary to land them. The council should work with companies to collect the data and make it available, she said. She said the council should redirect the resources to programs that show results. She also promoted the president’s push for more vocational education. College, however valuable, “is not the right path for everyone and should not be perceived as the only path for everyone,” she added. The majority of jobs require only a high school diploma or a professional certificate, according to a 2014 Georgetown Center study. “They asked my daughter Ivanka whether or not the media is the enemy of the people. She correctly said no. It is the FAKE NEWS, which is a large percentage of the media, that is the enemy of the people!” he said. About 7 in 10 Americans believe traditional major news sources at least sometimes publish news that is fake, false, or purposefully misleading, a June poll showed.